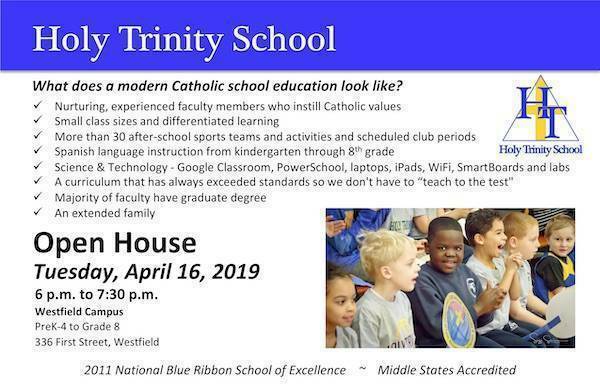 Holy Trinity School's Westfield Campus will hold an open house at the Westfield Campus, which offers Pre-K 4 through 8th grade. Do you want your child to learn in an accepting and caring environment, with a focus not only on top-notch academics but also developing well-rounded, community-minded individuals? Holy Trinity School provides a nurturing, creative environment that instills in children the skills necessary for academic excellence. Small class sizes and differentiated learning in math, English and literature give all students the personalized attention they need to thrive. And with religious instruction as part of the program, respect and caring for others are taught every day, throughout the curriculum. Holy Trinity prepares students for the future. Students take part in STEM and project-based learning at every grade level. They also have access to a state-of-the-art computer lab, as well as Google Classroom, SmartBoards, IPads and Chromebooks. 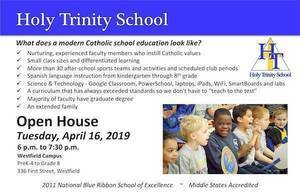 Holy Trinity School is currently accepting students at all grade levels, including middle school. Join us in taking a tour, seeing the campus and meeting our teachers. Come see how a faith-based program enhances the development of a child.